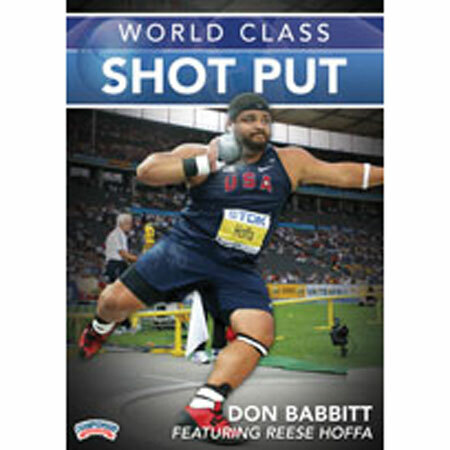 With incredible and insightful coaching and demonstration from World Champion and Olympian Reese Hoffa, Don Babbitt provides you with "what you need to know" to be successful in the shot put. •Warm-up - This shot put specific warm-up consists of a light jog, a series of static stretches that focus on the low back and legs, and med ball throwing drills to prepare for shot put training. 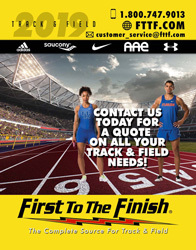 •Grip and Release - Babbitt presents technical instruction for gripping the shot while detailing the differing neck placements for gliders and rotational shot putters. Three release drills place an emphasis on pushing the shot without spin on the release. •Standing Throw - Babbitt takes Hoffa through a five-step teaching progression that begins with an arm strike throw and progresses through to a power position with a throw. He highlights the keys to poser position and includes drills for rhythm and balance. These drills are appropriate for a full range of ability from beginning through elite. Once that athlete has a good grasp on the power position with standing throws, Babbitt introduces the reverse to the throw to assist the shot putter with increasing distance. •Full Glide Technique - Babbitt teaches a simple three-drill progression for the glide shot. Included are glide shot put throws with and without reverse. •Rotational Technique - Babbitt implements a 12-drill progression that leads the shot putter through every phase of the skill, including a complete throw with a reverse. •Training schedule - Babbitt discusses his philosophy and structure of throwing workouts. He offers examples of a thrower's training week and how to balance throwing with weight and agility training. Also included are the weight training and conditioning exercises he uses, as well as recommendations for how to train at the high school level. Downloadable workouts are available on this DVD. Throughout this entire DVD, Babbitt takes time to explain not only the how of each particular drill and phase of the throw, but more importantly, the whys. Understanding the whys affords both coach and athlete a keen insight into what to look for to prevent and/or correct errors. This DVD is certain to be a difference maker for coach and athlete!